What are pleated and flat front pants? 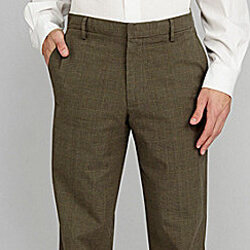 9 Comments on "Style Dilemma – Pleated or Flat Front Pants"
Thanks I must say flat fronts are better than pleats. Anyway its to know what the difference is. I find pleated pants are much more comfortable than flat-fronted pants and chose pleated whenever I can (sadly stores seem to push flat-fronts). I couldn’t care less if they are slightly less ‘fashionable’. The fact is I need the extra space afforded by pleats, not because I’m fat, but because I have appendages between my legs that need space! That is why traditional pants were pleated and modern pants are flat-fronted, it is part of the feminization of men. Flat-fronted pants are for women. I have been buying suits for 30 years. When I first started it was flat front. Then they switched the style to pleaded and you could not find a flat for men in any men’s store. I came in with a flat and asked the salesman if he had anymore and he chuckled that if he had a flat, he would sell it to me at a steep discount to get it off the rack. 7 or so years ago the switch to flat front came back and guys were wearing suits that barely fit them. They looked silly. I kept wearing my pleats. Some guys pants were so tight with the flat style it was uncomfortable to sit for long periods they told me. I have stayed with my pleated suits. I do have some flat dress pants that do have some room in them. Pleats will be back soon. I know this because it’s the only way suit makers and pant makers can make $$ is switching the style every few years. Because with men’s clothes there is not much you can do–flat to pleat and pleat to flat and keep changing every few years. Hold in there–pleats will flood the stores eventually. Hey everyone, Archie is not fat and he wears real man pants !! It’s an age & shape thing mostly. If you are over 50 & out of shape…go with pleats. If you are under 40 & in shape…you will look better in flat. There are some exceptions, but the guy who tries to claim he needs the extra room of pleats for his jewels and that flats are another sign of feminization… Just has issues…lol ? 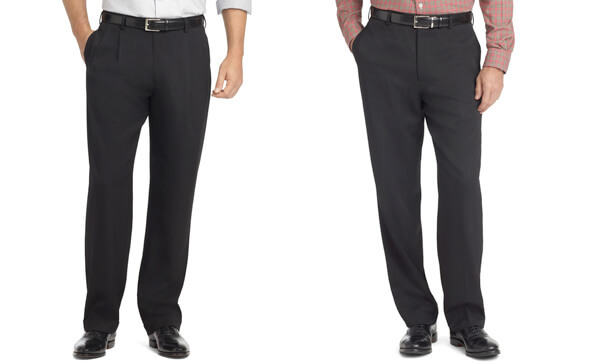 I need some clarifications.on pleated, cuffed suits vs. flat front Men’s business pants and attire. 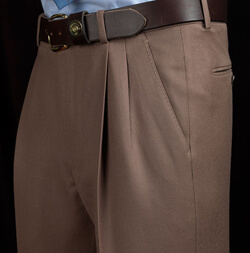 In the early 2000’s, I was a marketing executive and while I was in those levels of position, since the late 1990’s, I have always worn Designer Suits: pleated pants and cuffed pant legs. However, due to the recession, my industry failed and I retreated to a side-skill, which is cabinet-making, picture framing and carpentry, which was a jeans and t-shirt job every day. Equally, it was tiring work for a healthy but 51 year old man. Now, with the economy much better, I am trying to re-enter the corporate world. But the question remains: what does a 51 year old man wear in Atlanta, while looking for meaningful employment? Will I be a joke if I have all of these “Classic” pleated & cuffed (in my era) designers suits altered to fit? I must have a dozen plus of Ralph Lauren, Evan-Picone, Oscar de la Renta, Christian Dior or Joseph & Fleiss, worsted wool, pleated front and cuffed pants suits worth thousands of dollars. I usually finished these suits off with a pair of Johnston & Murphy capped toe (Oxford style) or wing-tipped shiny pair of black leather shoes. Now, progressing through the 2nd Decade of the 21st Century, I am in the process of reevaluating my wardrobe. Which is 95% Pleated and Cuffed Pants and a mix of 2 and 3 button jackets. I don’t know where to spend my money? Starting from scratch and buying less expensive suits or altering the dynamite collection that I already own? I am sure that there are thousands of middle aged men like me with a closet full of expensive suits. In our heads, I think we say this attire says to the young men and women with whom we are competing, “Hey, old man, you look like a G-Man from the 40’s”. It’s intimidating. I’m mean really. I spent a life time and a fortune building a wardrobe for an extremely high level of corporate success. It benefited me greatly from 1985 to 2009. The then entire business strata collapsed. I’m just not that old, and certainly wiser than my college aged children, but how a man looks is the equivalent of how a man feels. I know I must be blathering, but I know many men in my situation. So again the question: Pleats and cuffs or flat fronts and straight legs? I have to make an investment and I do not know where to put it in my wardrobe expenses. You all are great; I need a confidence building answer, Please. P.S. 10 Years ago I always got excessive compliments on my suits and appearance. Now, I just don’t know what to do. I loved all those suits. Are the still in style at all? I see in 10 mos no one has answered KB. We are the same age so I think I can help. Your suits are 10+ years old, so…. it is time to set them free. You will look dated. Pleats are OK, but not the rage. I like single pleats with cuffs. But, double cuffs can look dated. Try flat front, but no cuffs. Go buy a couple of Hart Schaffner Marx suits and you will be good to go. Good Luck!